MyStompz is available for iPhone and iPad. It allows you to recreate the layout of your effects pedal controls. You can then store your pedal settings and never lose them again. 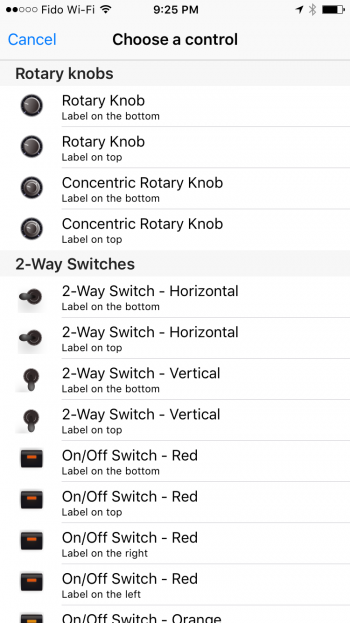 This is the iPhone version – List of available controls. A tap on the “+” icon of the stompbox shows the list, where you can pick an choose the control you want to add on the pedal. A quick hint: once you have set up your control to your taste and located it on the stomp box, if you need more of the same type (live, angle etc.) give the Duplicate icon a try!